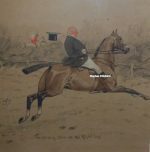 The Lionel Edwards Prints of Hunting, Horse Racing, Polo, Military and Pig Sticking pictures listed below represent a small selection of paintings available by the artist Lionel Dalhousie Robertson Edwards. If you can’t see the Lionel Edwards Print or Painting that you’re looking for then please contact us on 07889 800857. Lionel Edwards illustrated for many periodicals including The London News, The Graphic, The Sphere, The Illustrated Sporting & Dramatic News, Country Life etc. and made a living painting sporting pictures. Many hunting prints were produced after his paintings, the early ones were of a caricature type, but as time progressed his work became more traditional. 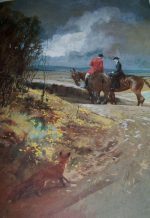 In the 1920’s Edwards painted a series of pictures of named hunts entitled ‘Shires & Provinces’ or Lionel Edwards Hunting Countries as they were also known, which were produced as limited edition prints. Watercolour was his favourite medium, though he used oils more frequently in later life. 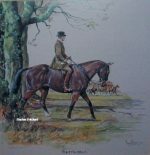 After Munnings, Lional Edwards was probably the most important sporting artist of the hunting field of the first half of the twentieth century. 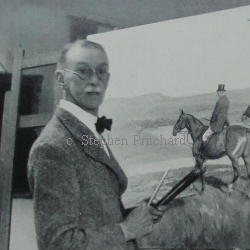 Edwards also illustrated more than 100 books and is described by Stella Walker in her book ‘British Sporting art in the twentieth Century’ as the “The grand old man of sporting art”. His career spanned more than six decades.